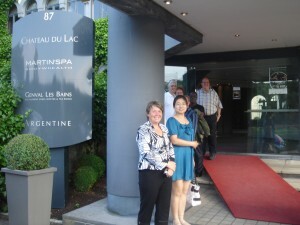 Prof. Xue, Chair of APRALO gave a presentation at APTLD Colombo Meeting in July 2010. This is the second briefing given by Prof. Xue to the Asia-Pacific ccTLD community. Although she was at the Nomination meeting at the suburb of Brussels, she managed to call in the APTLD meeting despite the difficulties of time zones and connections. APTLD staff went out for lunch and let Prof. Xue waited quite a while online. Eventually the connection was resumed and she gave the brilliant presentation, without being able to get the souvenir for all the presenters. In 2009, she managed to give a presentation on behalf of APRALO to APTLD via remote call-in, when she was in Connecticut for a conference.